Researchers at Princeton University are currently working on two projects to reduce jet travel's role in global warming. The first one, a major project funded by the U.S. Air Force with $7.5 million, is focused on developing computational models that accurately simulate the burning of jet fuel, a complex process not well understood today. The second one, funded by NetJets, a company providing business jets, will help to develop new jet fuels with near-zero net greenhouse gas emissions. First, let's look at the U.S. Air Force- sponsored program via its Multidisciplinary Research Program of the University Research Initiative (MURI) which "involves researchers from four institutions -- Princeton, Case Western Reserve University, Pennsylvania State University and the University of Illinois-Chicago." So what is exactly the goal of this project? 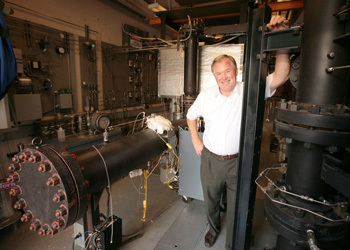 Dryer and his MURI collaborators, including Yiguang Ju, an associate professor of mechanical and aerospace engineering at Princeton, "will develop methods to predict and evaluate how jet fuels will behave in actual engines and characterize the emissions they will produce. While current guidelines specify some overall properties of jet fuels, they do not spell out the actual chemical composition. Depending on the source and processing method, jet fuel typically consists of hundreds to thousands of molecular structures that behave in a variety of ways." And as noted Dryer, "The composition of fuels changes with the geographic source, the refining process and even with the season. Since we have an energy security problem, we need to be sure that alternative fuel sources are going to work and, in order to do that, we need to understand exactly how petroleum-based fuels work alone and in combination with alternative fuels." This leads us to look at the NetJets-sponsored project about alternative energy sources. "Two alternative fuel sources that are the subject of much investigation in the aviation field -- coal and biomass -- present a major quandary to researchers attempting to develop low-emissions jet fuels. Coal, a relatively cheap and readily available source of energy, has an emissions profile at least as harmful as petroleum. Biofuel -- fuel made from plants -- presents an attractive alternative because the carbon dioxide emitted from burning biomaterials will be removed from the atmosphere by a new generation of plants during photosynthesis." But are these alternative jet fuel sources feasible -- and credible? As says Dryer, these alternative sources of energy need to be compatible with petroleum and produce similar combustion performance. This will only be possible if we fully understand how both petroleum and alternative fuels burn and design engines based on this fundamental knowledge."